Japanese clothing is known for their traditional Kimono, which can be worn in any occasions like weddings, birthday, thanksgiving and holidays. These traditional clothing can be worn depending on the season and the age of the person. There are kinds of Kimono, like Yukata that can be worn in summer, Haori, it’s like a jacket, Michiyuki is like an overall and the Hakama is a Japanese pants. 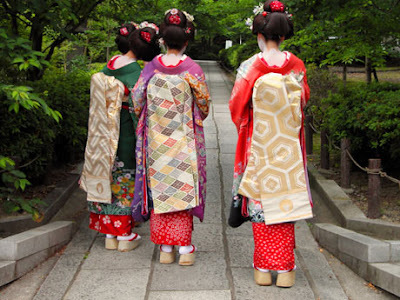 Mostly Kimono has a woven pattern with repeated designs which means good luck and prosperity to those who will wear it . For unmarried women, she can wear a kimono with long sleeves, while the older and married women can wear a much simpler and a complex design. They also have their traditional footwear, these are sandals, like geta, zori, vinyl zori and tatami. Today’s Japanese fashion is changing fast from old tradional clothing to new trends and styles that will fit into global fashion. Japan has evolved into something that they called it “Street Fashion”, or the Decora Style. This trend most likely has a bright colored clothing, with much in accessories like earings, bangles and the likes, added also a multi-layered socks, all in a very decorative way of fashion. This entry was posted on 12:01 PM and is filed under japan clothing , kimono tradition , Wfashion . You can follow any responses to this entry through the RSS 2.0 feed. You can leave a response, or trackback from your own site.